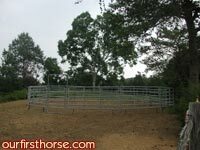 We Have a Round Pen! Yesterday evening we went over to our favorite horse friends’ house and picked up a portable arena they weren’t using. We loaded it onto our trailer when we got there, enjoyed a nice dinner with their family, and headed home a little after 9:00 p.m. So do you think we parked the trailer somewhere and left it for tomorrow? Heck, no! We were out in our dark pasture with the truck lights on, plus our Jeep facing in from the other way, hauling that thing off the trailer and setting it up. If we didn’t have to get the Kid to bed for school, we probably would have tried it out with a horse. We’re so excited! And, just in time, we’re supposed to start getting cooler weather this week. I do have this big project I’m working on with a deadline looming…but I’ll find a way to squeeze some arena time in too. Did I mention that we’re really excited? We are really excited!